Defenseman Tim Rose is headed back to the Woodstock Slammers of the Maritime Junior ‘A” Hockey League. The trade is Rose’s third in four years in the league and came unexpected as the Stephenville native returns to the team that gave him his start in the 2010-11 season. The Tigers were sitting in the basement of their division with a 9-21-1-1 record. This would have been devestating for Rose’s career as he was in the last year of eligibility in the league. The Slammers are making a push for the playoffs and are currently sitting in third place with a 14-14-2-1 record. Woodstock has been like a second home to Rose and even though the team has seen a major makeover in the last few seasons, he indicates that returning feels right. 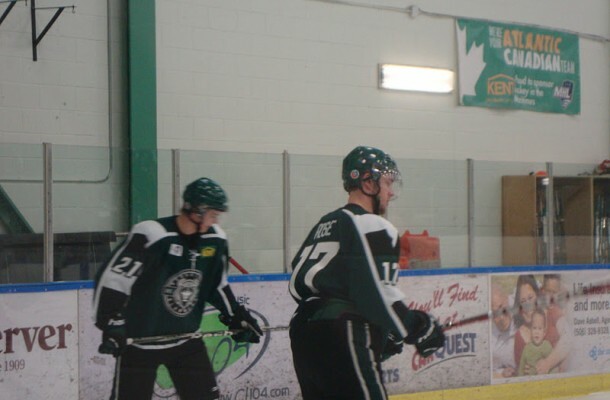 He had previously helped the Slammers in the MHL’s Kent Cup Championship and reach the Fred Page Cup Eastern Canadian Championship. Rose describes himself as a “third-pairing” defenseman with a knack of keeping pucks out of the net. The Slammers are looking for some one to help them reduce their goals against average in that they currently have allowed the third most goals against in the league. Rose will be expected to step up the efforts and play on the blue line to help turn that number around. While he isn’t expected to help out offensively having only scored 1 goal and 5 assists in 28 games this season, he is expected to show a leadership role to some of the younger players on the roster. Rose feels that the Slammers have the depth and that they can make a deep run in the playoffs with a few more key acquisitions. Rose sees this latest stint with the Slammers as an opportunity to improve his game and showcase his talent. He expects big things from himself after he returns to Woodstock following a Christmas break at home with friends and family.